Just no place in particular in January, perhaps – but here at Zen 2.0, it’s time to honour being partners-in-crime with Ro. 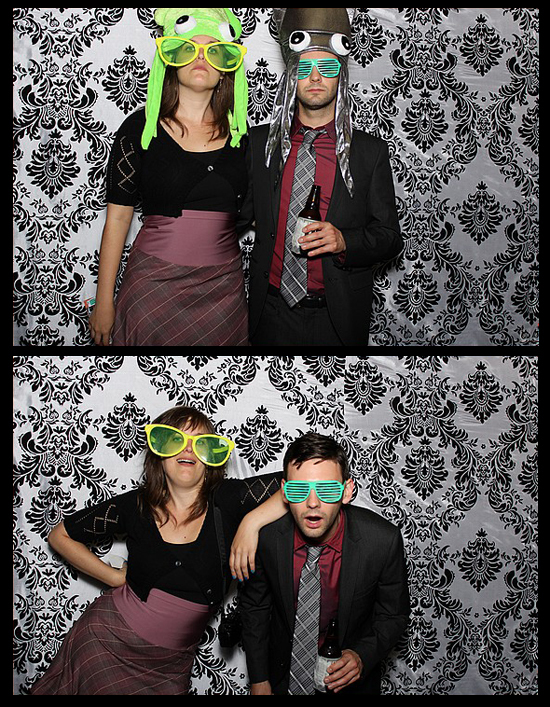 Even at a wedding photo booth (Congratulations Olivia & Tristan!) our default pose is American Gothic. We look good in squid hats; check out that swagger! Ro makes me laugh. He holds my hand at the suspenseful bits of movies. I admire him because he follows his heart with steady steps. Happy Zen Anniversary! Happy Anniversay you two! I love how you OWN those hats and novelty glasses. My kind of people! Look mom, I'm Squid Kanye West! Happy anniversary! I miss having tea with you two all the time. You know I would have gate crashed this anniversary somehow! Happy Zenniversary! We can all hope that their partner in crime wants to include stylish Squid hats in the relationship and then manages to wear it with a flare that even Elton John couldn’t hold a candle in the wind to. Utterly brilliant! Thanks Kristi! …& now I know exactly what I’d like to wear next time I’m invited to Elton’s house.